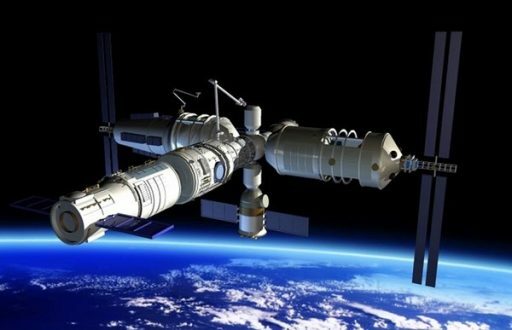 China’s Tianzhou-1 cargo resupply craft, currently docked to the Tiangong-2 Space Laboratory completed its second in-orbit refueling demonstration – continuing a pathfinder effort for the country’s future modular space station that will need regular cargo deliveries and refueling propellant to stay in orbit for an extended period of time. 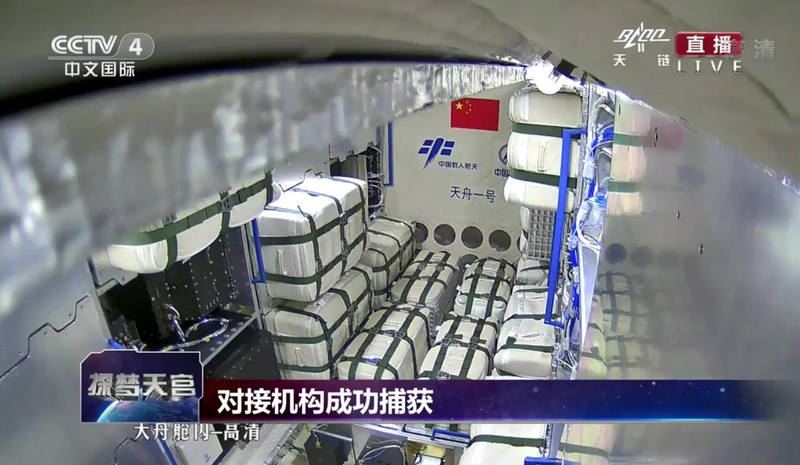 Chinese space officials reported the second of three refueling exercises planned for the Tianzhou-1 mission concluded at 10:28 UTC on Thursday. 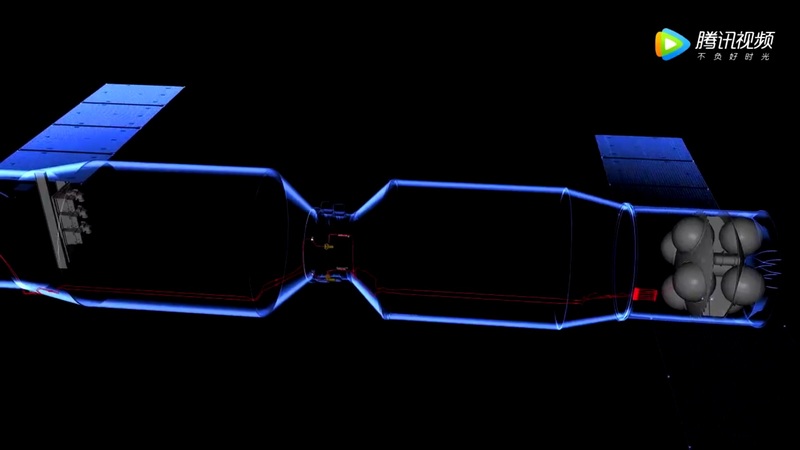 The refueling took two days and provided valuable data on the repeatability of the refueling which will be a key requirement for future station operations. 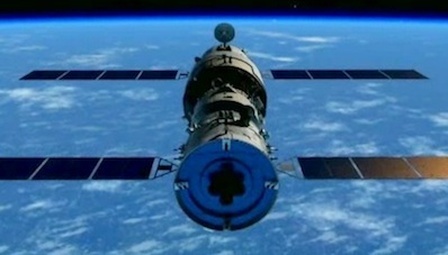 Tianzhou-1 docked with the Tiangong-2 spacecraft on April 22, forming China’s largest orbital complex to date with a length of over 20 meters and a mass of close to 20 metric tons. The first refueling exercise, comprising 29 discrete steps, began shortly after the craft’s arrival and concluded on April 27 to mark the final critical objective of the Tiangong program that demonstrated all the necessary technology and techniques for sustaining a space station in orbit for many years. 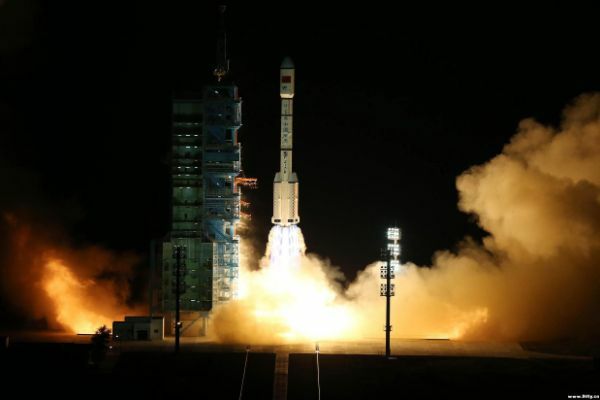 China’s 12,900-Kilogram ‘Heavenly Vessel’ hosts eight 230-liter propellant tanks holding roughly two metric tons of Monomethylhydrazine fuel and Nitrogen Tetroxide Oxidizer – over half of which was pegged for transfer to Tiangong-2 while the rest is used by TZ-1 in a unified propellant system that allows for a maximum of propellant to be transferred to the station module as opposed to a system with separate tanks. The repeatability of the fluid transfer was the primary objective of the second refueling test and will be demonstrated again before the Tianzhou-1 mission ends – leaving Tiangong-2 with fully topped-up tanks to continue orbiting the planet for years to come. 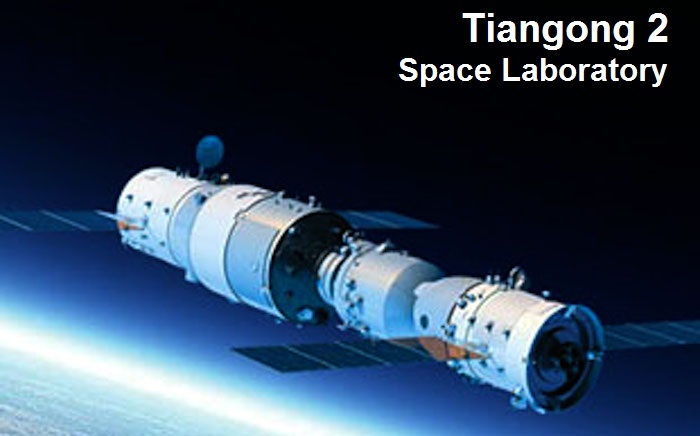 The Tianzhou-1 – Tiangong-2 complex is currently tracked in an orbit of 377 by 391 Kilometers, inclined 42.8 degrees. According to press reports, Tianzhou-1 will undock from Tiangong-2 late in June to complete a flyaround and re-initiate an automated approach on a different trajectory to demonstrate the cargo vehicle can fly different rendezvous trajectories to add flexibility to its mission profile. 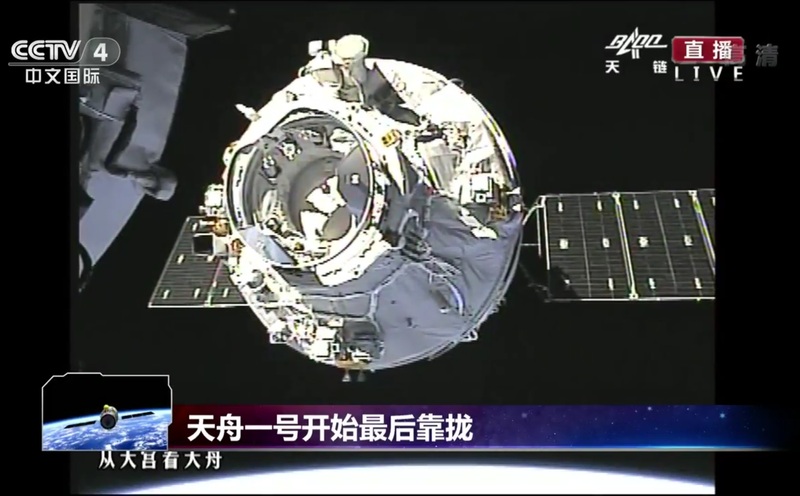 After re-docking, Tianzhou-1 will only stay briefly before the combination will separate again to enable TZ-1 to begin a series of space science experiments while Tiangong-2 can also re-activate its Earth- and Space Science payloads to continue collecting data. At the end of the three-month free flight will be another re-rendezvous, this time using a fast-track approach that could enable a six-hour launch-to-docking profile for future crew mission’s to the Chinese Space Station (CSS). Tianzhou-1 will conclude its five-month mission with a deliberate deorbit maneuver to burn up in Earth’s atmosphere over the Pacific Ocean’s spacecraft cemetery. 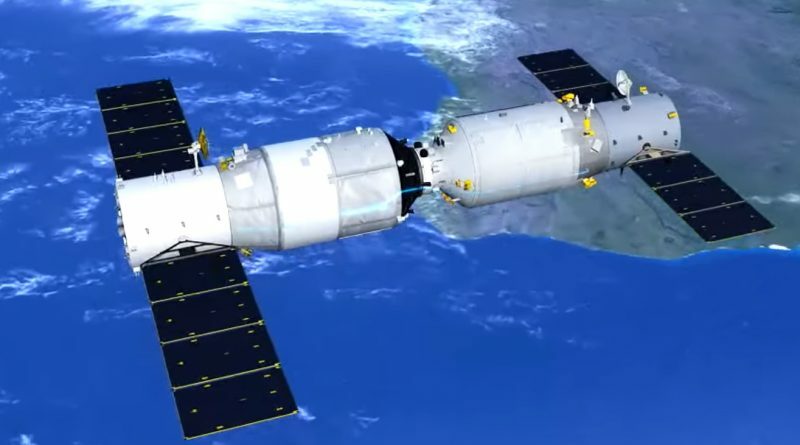 The third and final phase is already in full swing on the ground with the assembly and integration of the Chinese Space Station that will comprise at least three modules. 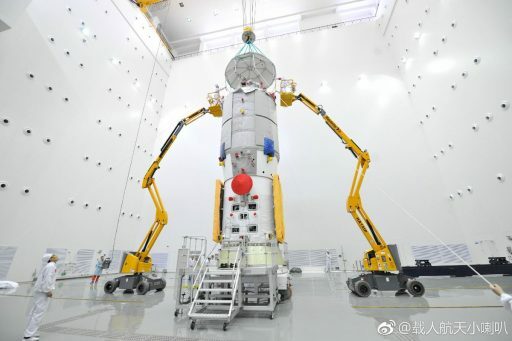 The Tianhe Core Module has already finished assembly and is targeting a 2019 liftoff atop China’s powerful Long March 5 rocket. This will be followed by two large science modules called Wentian and Mengtian. 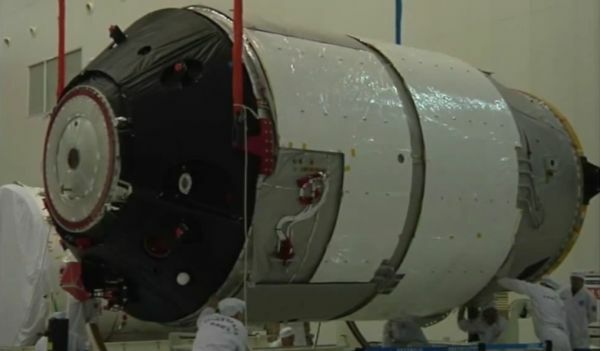 China’s next crewed mission will occur when Tianhe is in orbit and has already received the Tianzhou-2 cargo vehicle to enable the in-orbit outfitting of the core module.